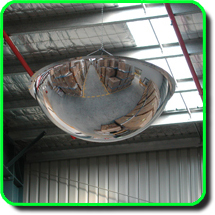 DuraVision Dome Mirrors are designed specifically for indoor use in warehouses, offices and factory environments. Each dome is designed with a specific radius of curvature for each size to ensure to maximize the viewing area. Manufactured using only mirror grade acrylic for the best reflective surface and long life. 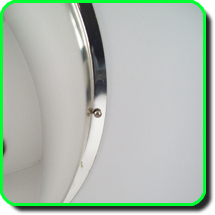 These dome mirrors are supplied with hanging suspension kits (pic 1.) and dome capped screws for direct mounting to a ceiling (pic 2. ).